Lindy (sis in law) gave me this recipe to post. She made this for our small group one night & it is incredible. Preheat oven to 350 degrees. In large bowl, combine butter & peanut butter until smooth; add brown sugar & baking soda & heat well. Stir in flour & oats. Set aside 1 3/4 sup crumb mix. Stir egg into remaining crumbs in bowl, put into a 15 x 10 in baking pan. Bake for 15 min. Spread Eagle Brand over crust. 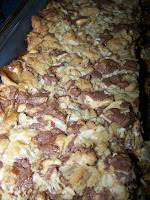 Stir together reserved crumb mix & chopped candy bars. Sprinkle over top. Bake for 25 min or until golden brown. Cool & cut. Store leftovers loosely covered at room temp.